Expedition 50 Commander Shane Kimbrough and Flight Engineer Peggy Whitson concluded their spacewalk at 1:55 p.m. EST. 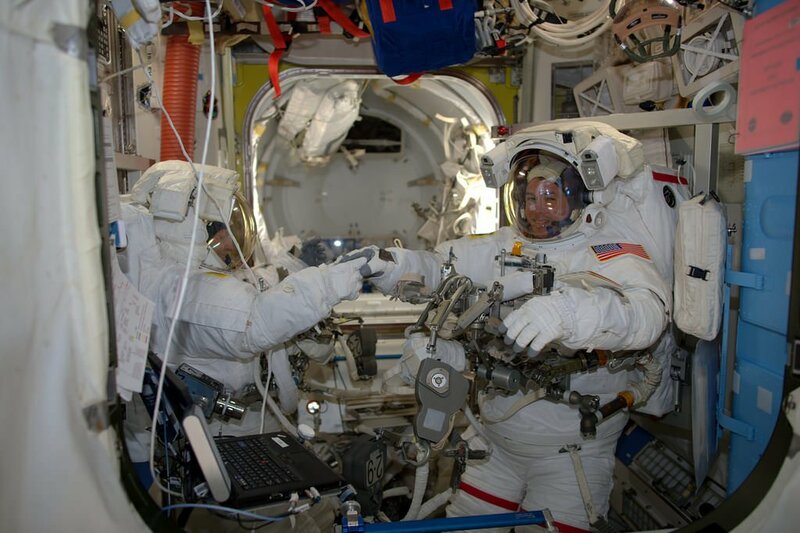 During the six-hour and 32-minute spacewalk, the two NASA astronauts successfully installed three new adapter plates and hooked up electrical connections for three of the six new lithium-ion batteries on the International Space Station. They also accomplished several get-ahead tasks, including a photo survey of the Alpha Magnetic Spectrometer. The new lithium-ion batteries and adapter plates replace the nickel-hydrogen batteries currently used on the station to store electrical energy generated by the station’s solar arrays. Robotic work to update the batteries began in January. This was the first of two spacewalks planned to finalize the installation. Kimbrough and Flight Engineer Thomas Pesquet of ESA (European Space Agency) will conduct the second spacewalk on Friday, Jan. 13. NASA Television coverage will begin at 5:30 a.m.
Once again, Kimbrough will be designated extravehicular crew member 1 (EV 1), wearing a suit bearing red stripes for the fourth spacewalk of his career. Pesquet, who will be making the first spacewalk of his career, will be extravehicular crew member 2, and will wear a suit with no stripes. Space station crew members have conducted 196 spacewalks in support of assembly and maintenance of the orbiting laboratory. Spacewalkers have now spent a total of 1,224 hours and 6 minutes working outside the station. The stripes are designed to identify each individual space walker. Good work! Did you ever wonder why they are not using atomic power generators? Like submarines!